This is the Flight Controller of choice for many of the leading FPV Pilots in the world, including Minchan Kim, Milk FPV, Gapit FPV, Banni UK; just to name a few. And for good reason, it was designed for intense competition. This stack is built with premium components that won’t let you down on race day. This stack features the best specs for today’s racer such as an onboard SD slot, LED strip, STM32405, ICM20602, and onboard filter circuit for your VTX (when used with 10v BEC on the XRotor Micro 45A ESC). 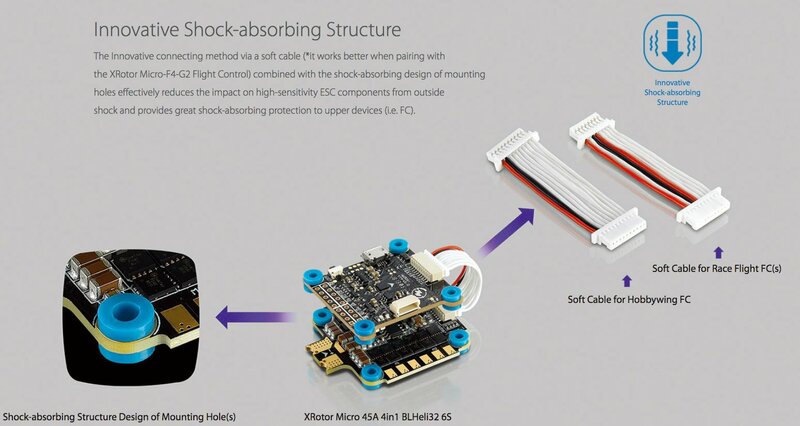 Pairs perfectly with the XRotor 45A Micro 4-in-1 ESC. F-card which can record and save more flight/black box data allows users to adjust the setup of their aircraft easily. Volt/Amp monitoring port allows users to check the battery voltage (BAT port) and current (CRT port, extra current meter is needed).